Manchester is considered the UK’s second city and is the unofficial capital of the North. The city has come a long way from its industrial roots and is now an edgy, ambitious city that will not fail to charm you. If you are visiting the UK, don’t miss out on a trip to this entertaining, vibrant city. The city is packed with culture and has a thriving arts and music scene. Deciding where to go and what to see is tough, because Manchester offers so much to do. The city is also known for its sporting prowess, and is home to two famous football teams and rivals; Manchester United and Manchester City. There’s an endless selection of bars, cafes and music venues. Lose yourself in the shopping centres, party all night long or head on a cultural tour of the city. Manchester rivals London in terms of attractions, character and entertainment. 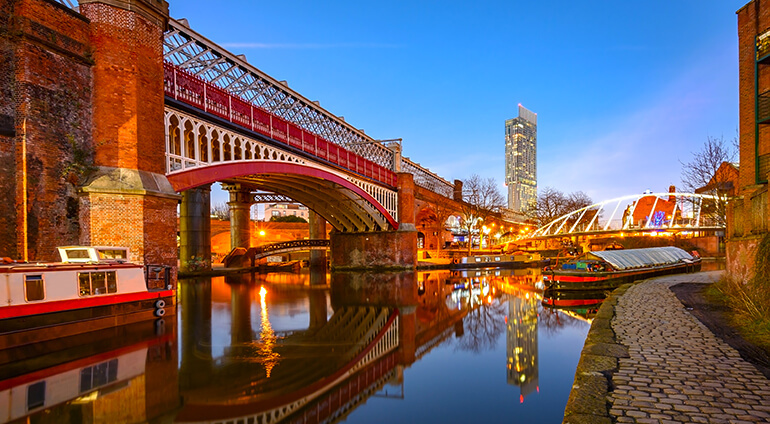 Book a trip to Manchester and uncover this refreshingly cool, vibrant and charismatic city.